When we start migrating our database from SQL Server to Azure Database, we want to know what are the pricing models are offered by Azure and how do we know the correct Pricing model/Service Tier suitable for our database. This article will going to discuss about the pricing models offered by Azure and helps in choosing the correct Service Tier as per our database workload need. 2) What is DTU ? DTU or Database Transaction Unit can be defined as the blended measure of resources like memory, CPU, Data IO, Log IO guaranteed to be available to an Azure database at the specific performance level. It simply defined how powerful your Azure database is and used as the unit of comparison. Higher the DTUs higher the performance. For example, if 5 DTUs takes 100 seconds to executes 15 queries, then 100 DTUs will going to take 5 seconds time in solving these 15 queries. Azure gives us the flexibility to easily move from lower service tier to higher service Tiers and from higher service tier to lower service tier at any point of time. Duration of the change in service tier will depend upon the database size. Change in the charges will only comes into effect once the change in the service tier got completed. In Addition, Azure billed single database on the hourly basis based on the highest Service tier used in that hour. Please Note– If you upgrade database to over 1 TB storage option, you will not be able to downgrade this database to 1 TB or below or to a performance tier below a P11. You will not be able to add this database to an elastic pool. Using restore, copy, or geo-replication will require over 1 TB storage option with a P11 or P15 performance tier. After we got understanding about the DTUs and Service tiers, next question comes how do we know the number of DTUs needed when we migrate our SQL database to the Azure because it will finally going to help in choosing the correct Service tire. To help us, we have a DTU Calculator at http://dtucalculator.azurewebsites.net . This DTU Calculator has been developed by Justin Henriksen, Azure Solution Architect at Microsoft. 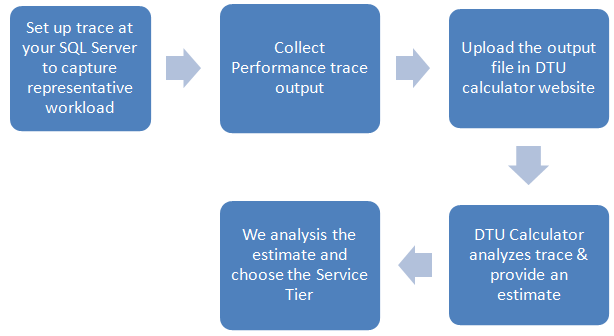 As you have seen in the above work flow, to know the most accurate resource utilization of our database, we first need to capture below mentioned utilization metrics on our SQL Server. For capturing the correct performance metrics, we can use one of the utilities, Command Line EXE or PowerShell Script. These utilities can be downloaded from the DTU Calculator website. We need to capture representative workload for getting the best result which may require to run this utilities to at least some hours to few days. Now if you open the config fie SqlDtuPerfmon.exe, you may need to take care of the below highlighted sections and change its value accordingly to your needs. 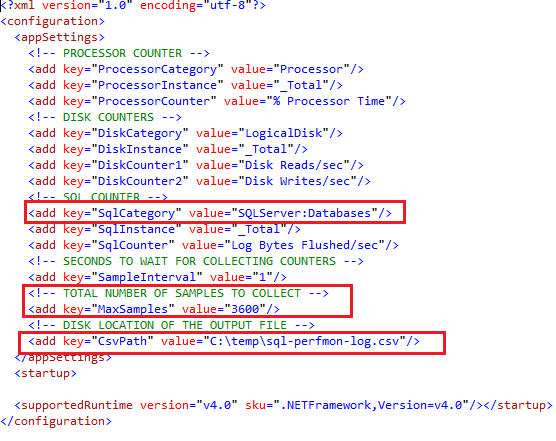 1) In the first highlighted section with key as “SqlCategory”, if you don’t change the value and execute the Utility as it is, it will work if your SQL server instance is the default one. If your SQL Server instance is the named instance then you need to change its Value. Also this utility work at the SQL instance level not at the database level. For specific SQL database, you need to use the other DMVs for Capturing this data. 2) In the second highlighted section, Value 3600 represents the number of seconds this utility will going to run for capturing the representative workload. By default it is 1 hour or 3600 Seconds. You can increase the value as per your requirement. But make sure that it ran for enough duration to capture the correct representative workload. 3) In the third highlighted section, value represents the location in the server where the CSV file containing the trace output going to save. Make sure the user has the required permission for writing the file in this location or you can change it to some other location. Once you the Utility execution got completed, you need to upload the CSV file into the DTU Calculator website and click on the Calculate button. In the above screenshot, DTU calculator gives the general recommendation about the Service Tier. It is an interactive chart where you can move the mouse on its various section and see how much percentage a selected Service tier can cover. Here, when I move my cursor to S2 section, it shows that it will going to cover 96.97% of my workload. If we scroll down, we see the above chart, where mostly DTUs are under 50 but there are some DTUs which are touching 125 mark. Here I run the utility for few minutes only for demo purpose. Due to this the Time values has the range of 0-1100 instead of 0-3600. As you seen in the above screenshot, you can move your mouse over on the chart to find out which Service Tier will cover most of the requirements. Here if we mouse over to Standard-S2, we see that this Service Tier/Performance Level cover most of the requirement as 98.75 % of CPU, 98.04 % of Iops, and 100.00 % of Log utilization. In previous article on Azure series, we talk about Azure in general and brief introduction of Service Tiers. In this article, we learns that are the 2 types of Price models Azure offers to its customers. In this article, we discuss the DTUs Based Price model in details along with different Service tiers which comes under this price model. This article also gives information about the values levels of the Standard Service Tier & Premium Service Tier. Also this article gives the information about the resources Azure offers in these service tiers and their impact on the application performance. After that we discuss what is DTU and how we can get the initial estimate of required DTUs to start with using the DTU Calculator. In addition to this we also got the information about how this DTU calculator work and how it gives the estimation of service tier we can use to start with. Very good article. Easy to understand. I like the way you have explained things in such a lucid language. Keep it up.